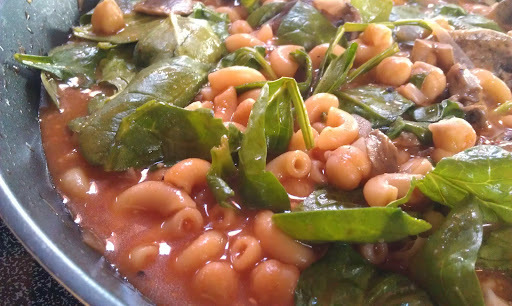 Spinach and Wine: EASY Vegetarian "Hamburger Helper"
I had Mushrooms and Spinach to use up, I wanted a quick and healthy lunch, I ended up with a bowl of comfort food and enough to freeze for future lunches or quick dinners! I am calling it "Hamburger Helper" only because of the type of noodle and the cooking process, cooking the pasta in the sauce makes for a wonderful starchy broth, perfect for this kind of meal. OK so here it goes...Its easy! Heat pan, add olive oil and diced onion, cook till onion is shiny and translucent. Add Mushrooms and saute for 3 minutes, add tomato soup, refill can with water twice and add to pan, stir. Add salt, pepper and chili pepper flakes, bring to a boil, add elbo macaroni, cover with lid or foil and cook at medium heat for aprox. 1/2 hr... I recommend stirring it a couple times and keep an eye on the liquid, you might need to add another can of water for pasta to cook properly. 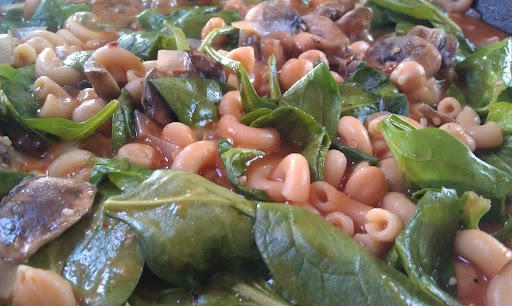 Once pasta is done, add the spinach, replace lid, turn off heat and let the spinach release its liquid. You do not have to limit yourself to the mushrooms, onions and spinach, this recipe lends itself to all combinations of veggies! The tomato soup can also be replaced with sauce or diced tomatoes and their liquid, I feel the tomato soup adds a bit more of a "comfort food" experience to it.